Uncover the little-known treasures of Los Angeles on a 7-hour insider walking tour with a savvy guide. 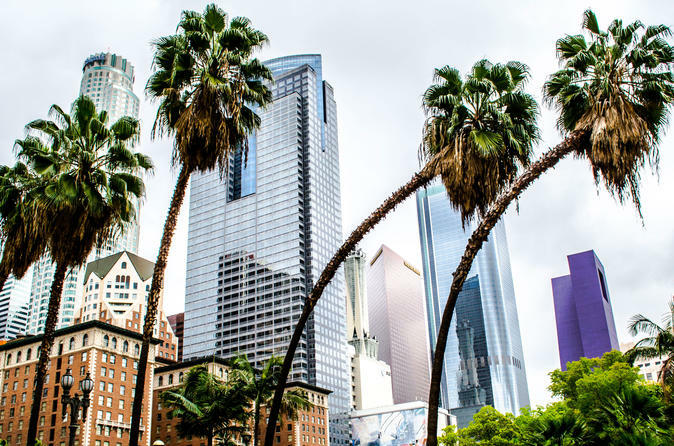 You’ll see top attractions like the Walt Disney Hall, the Grove, Hollywood Boulevard, and Rodeo Drive, as well as neighborhood gems like Bradbury Building in Downtown LA. As you walk, you'll learn the history of “The City of Angels” and its Spanish/Mexican roots, as well as view all of the most popular gems that make Los Angeles unique. At the end of the tour, you'll have the chance to sample a macaron at a fine French bakery in the heart of Downtown (optional, your own expense). Metro transportation is included. Meet your guide in the hotel lobby, and then set off on your 7-hour walking tour to explore La La Land. The start time and the itinerary can be customized to meet your preferences. Below is the suggested schedule. 11am As you walk in downtown LA your guide will point out examples of beautiful Spanish Colonial architecture. Continue walking to Walt Disney Hall. Its ultra-modern exterior will undoubtedly stick in your mind with its futuristic design, unusual shapes and bizarre lines. Take a look at Staples that hosts Grammys, concerts and live shows. Walk two steps away and discover stylish and brand new Microsoft Theater, one of the greatest indoor stages in the US and the venue for American Music Awards, Emmy and MTV Video Music Awards. Sneak a peak into the best eateries, nightspots and the Grammy Museum. Loud music and neon advertisements on huge displays will never let you forget that you're in LA. 12pm Pershing Square. Check out a welcoming green space block located in a close vicinity of the renowned LA Diamond District, take in the views of the skyline before we move on! Take fantastic photos of the Bradbury Building, the city’s antiquated masterpiece, you’ve probably seen it in 500 Days of Summer (2009) or The Artist (2011). You'll then head to a lively Grand Central Market to indulge in all the gastronomic pleasures LA can offer. You will have some free time to stroll the market if you want to have a bite or buy some local fresh produce. Take a break, enjoy the outdoor vibe of LA and chill out from the hustle and bustle of the city in the Grand Park, as your guide tells you the tales about Los Angeles’ art and culture. 1.30pm The Grove. Find yourself in Los Angeles of the past, walk through the cozy courtyards of The Grove – one of best shopping places in the US, filled with fashionable boutiques, restaurants, entertainment and eye-catching architectural compositions. It is the perfect place to grab a lunch at the renowned Farmers Market. 3pm Rodeo Drive (optional, if time permits). Walk along the most expensive street on the planet - Rodeo Drive. Track the scenes from the famous Pretty Woman that was filmed right here in some of these shops where Julia Roberts bought her outfits. 4pm Hollywood Boulevard. Finish your afternoon at Hollywood Boulevard – the epicenter of the global film industry and one of the most prominent districts of LA. Pass by the famous Dolby Theater where the annual ceremony of "The Oscars" takes place. Walk along the Hollywood Walk of Fame and try to find the names of your favorite actors among more than 2600 brass stars. 5pm At the end of the tour your guide will leave you at a famous Chocolate Shop where you can get a sample and shop for luxuriously deep chocolate with sophisticated ingredients.